The "Capela da Virxe Peregrina" is a highly unusual building situated in the "Praza de Peregrina" (square of the pilgrim) which is part of the larger Ferreria square. This chapel is unique and distinctive and attracts the attention of everyone who sees it. 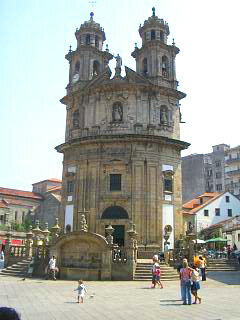 It was built in Pontevedra in 1778 and is positioned on the main pilgrim's route that leads to Santiago de Compostela from Galicia's neighbour Portugal. The chapel was built under the guidance of "Antonio de Souto" and "Bernado Jose de Mier" and is a fusion of Baroque detailing with some neo classical design elements. What makes the structure unique and eye catching is not however its intricate detailing (although there is plenty of that), but its shape and form in plan. The "Capela da Virxe Peregrina" has a ground plan in the shape of the "viera" (scallop shell), the traditional and long lasting symbol of pilgrims and the pilgrim's route to Santiago de Compostela. It also has the shape of a cross embedded within the "viera" profile. From the outside the chapel looks "stocky" but it is also strangely narrow and appears to be almost circular. It has a symmetrical appearance with several small windows climbing vertically up its facade and two small towers at it head. The portico is elaborate and has an equally decorative drinking fountain in front of it with a stair either side that takes visitors up to the entrance level, about four feet above the main square (photo left). Inside the Pilgrims chapel there is a neo classical alter that dates from 1789 and was designed by "Melchor de Prado". 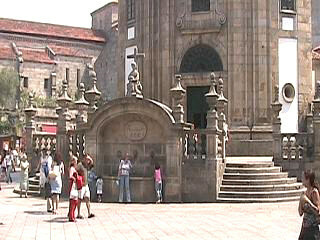 Its main feature is an image of Pontevedra's patron saint, the virgin pilgrim. The inside of the chapel is extremely small and none but pilgrims entered it when we were there. 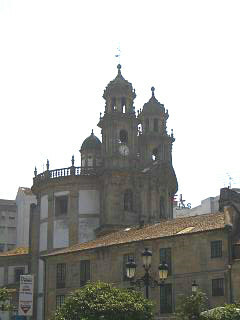 The pilgrims chapel achieved national monument status in Spain in 1982 and the pilgrims who pass it arrive at Pontevedra from the south. As a fixture on the Portuguese "Camino", a pilgrim traveling this route will only be deemed to succeed if he or she make a stop at this church. Right, a first view of the pilgrims chapel from the main Ferreria square. Return to Pontevedra main page.